The democratic project as a public project has been suffering from growing regulation mania for several decades, turning a free society into a risk-free society. Consequentially, money and focus is increasingly placed on prevention: starting with preventive frisking, camera surveillance and ethnic registration, and transgressing to spying on civilians. With this shift towards risk prevention the core of freedom and democracy has eroded. Democracy, after all, always possesses an element of danger. It is precisely in this element of danger where the possibility of change is located, the possibility of democratic innovation. Everybody has the right to democratic representation. What is more, everybody has the right to plea for the abolishment of democracy as such. This is the experimental and conflictual core of democracy. The plea for Free Zones attempts to reestablish this “space of experimentation” as the core of democracy: democracy as a space where authority does not interfere, unless something goes wrong. In a democracy power is in essence located with the people. The Free Zone celebrates this principle of public democracy. The New Forest is a multi-year project of theatre collective Wunderbaum that studies and represents social changes and transitions in our current society, in collaboration with civil society organisations and communities in and around Rotterdam. The New Forest represents a future world through performances, seminars, context (live and online) and an interdisciplinary film project. Taking Willem Schinkel’s book De nieuwe democratie [New Democracy] (2012) as a starting point, the recurring goal of The New Forest is the exploration of new models of democracy. The New Forest was temporarily based on top of the old train station in the north of Rotterdam, where it manifested itself as a public parliament: a political space where the question of democratic representation was once again the central focus and was discussed by people from all layers of society. What are the boundaries of democracy and can these boundaries exist at all when democracy is about representing the public as a whole? The public parliament is a Free Zone par excellence as it allows the possibility of collective debate and the shaping of the concept of “the people”. The essence of this proposition is that democracy can only exist within the permanent questioning of what democracy really is. As such, The New Forest is a case for the Free Zone: a questioning of democracy as the heart of democracy. Salima Belhaj is a council member of Rotterdam since 2008 and since 2010 she is party leader of D66 (Democrats 66) in that city. As such she takes an active role in the debate on racism and the debate on culture. In 2011 she participated in the first edition of the project Allegories of Good and Bad Government in W139, Amsterdam. In 2014 she had a decisive role in the coalition debates that led to the formation of the local government of the city of Rotterdam consisting of members of the political parties D66, Leefbaar Rotterdam [Livable Rotterdam] and the Christen-Democratisch Appèl (CDA, Christian Democratic Appeal). Maartje Remmers is a Dutch actress and member of the Flemish-Dutch theater collective Wunderbaum consisting of herself, Walter Bart, Wine Dierickx, Matijs Jansen, Maarten van Otterdijk and Marleen Scholte. In 2013 Wunderbaum initiated the four-year project The New Forest in which Wunderbaum explores together with civil society organizations alternative models of democracy through theater. See further: www.thenewforest.nl. Open! 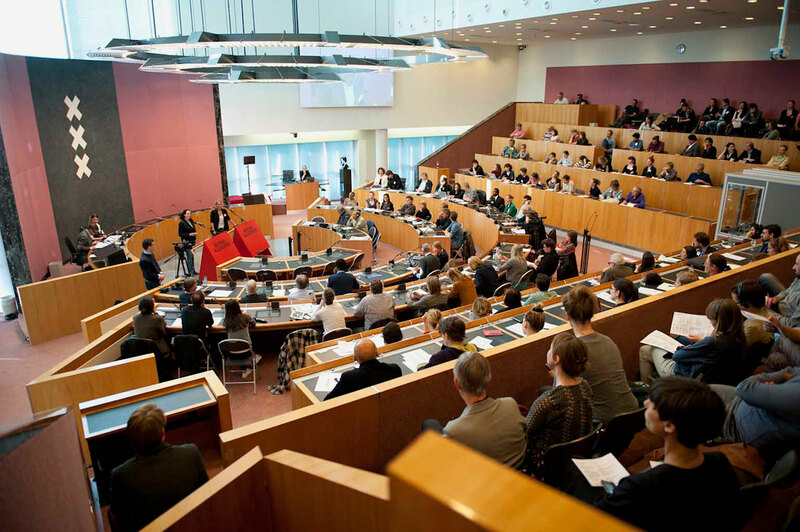 published the texts and videos developed on the occasion of the Beyond Allegories debate that took place in the City Council of Amsterdam on May 9, 2014. In Beyond Allegories politicians and artists discussed proposals on the role of art within governance, political mobilisation and action.